Heyward did that in last week’s season opener, which the Spartans won 38-31 over upset-minded Utah State. Heyward had 42 yards on just five carries, and two of those runs went for touchdowns. Michigan State was down by a point before Heyward’s 13-yard TD run on an option play with 2:00 remaining. Although LJ Scott remains the focus of the Spartans’ running game, there’s room for another back to contribute, and Heyward is off to a nice start. The Spartans, who dropped four spots to No. 15 in Tuesday’s AP Top 25 , play at Arizona State on Saturday night. Heyward is the son of the late Craig “Ironhead” Heyward, who played 11 seasons in the NFL and rushed for 4,301 yards. Cameron Heyward, a defensive lineman for the Pittsburgh Steelers, is Connor’s older brother. A high school standout in Georgia, Connor Heyward arrived at Michigan State and returned kicks last year as a freshman. His offensive contributions were minimal — three carries and four receptions on the season — but he figured to have an opportunity to do more in 2018. Scott is back for his senior season and is the undisputed top running back for the Spartans, but Madre London and Gerald Holmes are gone from last year’s team. That left a void behind Scott. 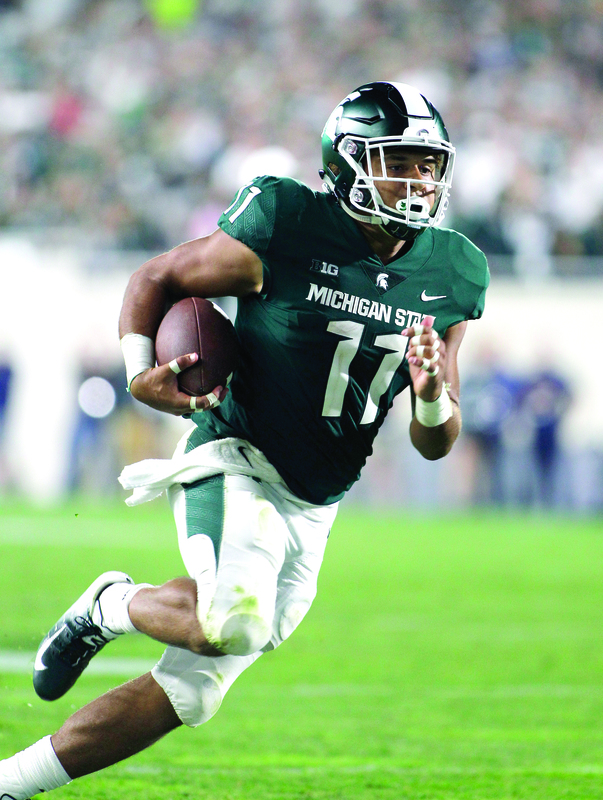 In the opener last week, Scott had a team-high 23 carries, quarterback Brian Lewerke had 10 and Heyward had five. The last time Michigan State had a 1,000-yard rusher was when Jeremy Langford had 1,522 in 2014. Even that season, there were still 107 carries left over for Nick Hill. There’s only so much the Spartans can lean on Scott. Heyward had one carry for 1 yard in the first half against Utah State, and then contributed 28 yards on three carries — including a 17-yard touchdown — on Michigan State’s first drive of the second half. His next offensive touch came on the winning TD.